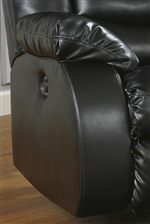 Family and friends will thank you when they take a seat on this welcoming reclining sofa. Plush pillow arms and divided seat backs with stitching offer amazing support that will make you never want to leave your seat. 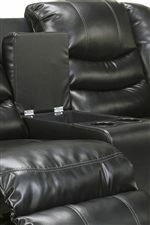 Each chaise is fully padded, guaranteeing head-to-toe comfort as you lean back to enjoy the recline function. 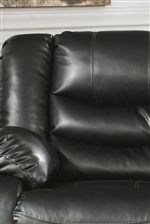 Upholstered with a unique Durablend® fabric for a contemporary look with extra durability, this reclining sofa is sure to give you the full experience in modern comfort. The Linebacker DuraBlend - Black Contemporary Reclining Sofa with Pillow Arms by Benchcraft at Michael's Furniture Warehouse in the San Fernando & Los Angeles area. Product availability may vary. Contact us for the most current availability on this product.